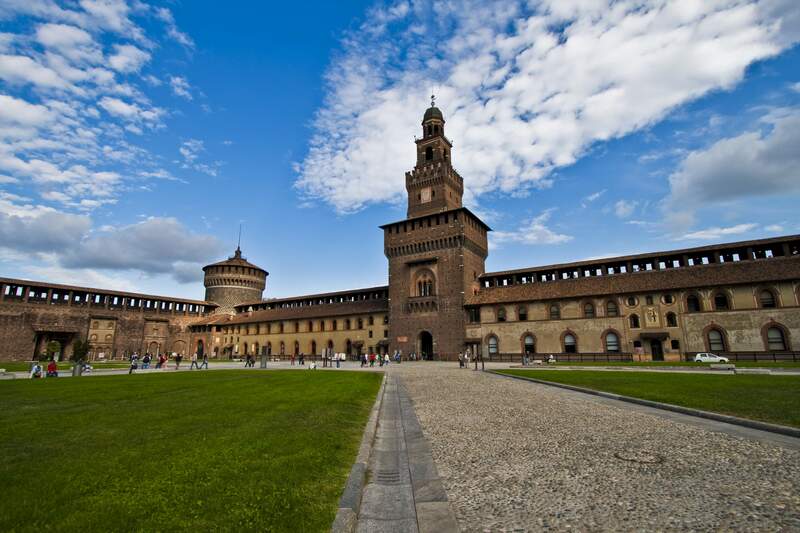 Accessible Sforza castle in Milan - ROME AND ITALY | TOURIST SERVICES IN ITALY! For centuries the people of Milan have considered the castle a symbol of tyranny and foreign oppression, and they’ve tried many times to attack and destroy this hated building. Things changed with the unification of Italy, when it became a cultural centre and was considered by the people of Milan a symbol of their city, a building they were proud of. 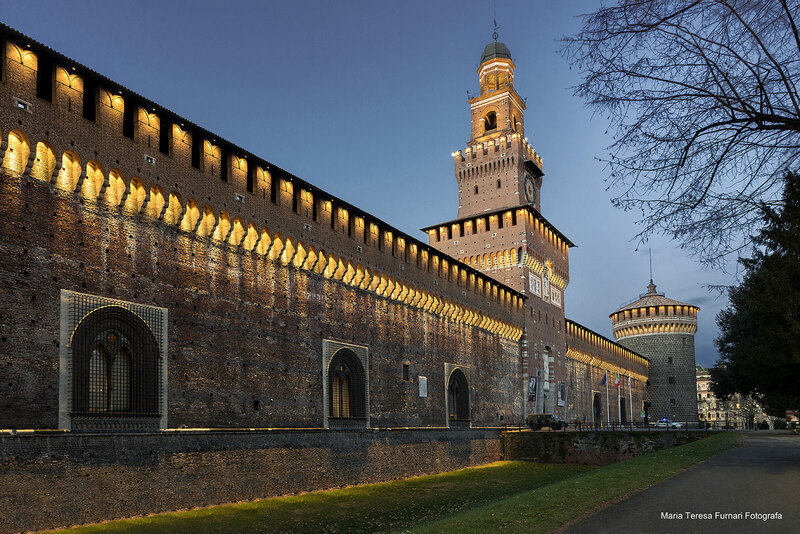 The palace was built by Galeazzo Visconti II between 1360 and 1370 as he became lord of the western part of Milan; his successor, Gian Galeazzo, added more buildings around the palace in 1392 to house the mercenary troops that fought under his command. The two parts of the structure were still divided by a ditch and have been eventually unified by Filippo Maria, the last of the Visconti. It is precisely in this moment that the castle, the biggest one built by the Visconti family with its 180 metres length on each side and its four big towers, became a family residence. The last man of the dinasty decided to live there in isolation and evenatually died without legitimate heirs, having only a daughter, Bianca Maria, who was married to the warlord Francesco Sforza, who had been called by Filippo Maria to defend the duchy of Milan from the venetian attack. The captain Francesco Sforza, a man of great military ability and a good sense for politics, eventually besieged the city himself and succeded to be acclaimed by the people of Milan as a liberator. On March 25th 1450 he and his wife Bianca Maria became legitimate Lords of Milan. Once he took power he immediately decided to renovate the castle to give the people of Milan a beautiful building and protect the city from enemy attacks. The works proceded rapidly under Francesco Sforza’s successor; in 1468 Galeazzo Maria, his son, and his wife Bona of Savoy moved to the castle with their court; in just a few years the “Rocchetta” and the Corte Ducale were completed, the rooms were painted and a new ducal chapel was built and adorned. Galeazzo Maria died in 1476 and his wife reigned over the city alongside her young son Gian Galeazzo Maria until Galeazzo Maria’s brother, Ludovico il Moro gained power and exiled Bona. In 1497, with the death of his wife and the french troops who were ready to attack Milan, he initially intended to resist and started storing food supplies and ammunition within the castle, but fearing a rebellion of his own people he fled to the court of the Emperor Maximilian I of Habsburg. He eventually died in France in 1508. In the next 200 years the castle fell under control of different european powers; first it was under french control, then it fell in the hands of the legitimate heir Charles V of Spain, and then it fell under austrian control when Eugene of Savoy conquered Milan in 1706; a period of decadence and ruin started for the castle who was later conquered by the armies of Napoleon and then fell again under austrian control in 1815. In 1893 began an important work of renovation of the castle by the architect Luca Beltrami, with the participation of the people of Milan who wanted to bring it back to the old splendour.